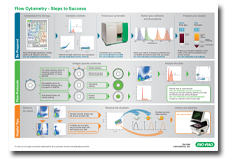 Discover the important steps to success in designing and carrying out a flow cytometry experiment. Planning your flow cytometry experiment can be time consuming. With this in mind, this new poster aims to help you plan your experiment by going through the key steps you need to consider before you start. It also includes information on staining protocols and useful tips to optimize your staining. Perfect as a quick reference guide for all your flow cytometry experiments, download or request your copy.